The Battle of Borodino (Russian: Бородинская битва Borodinskaja bitva, French: Bataille de la Moskowa), fought on September 7, 1812, was the largest and bloodiest single-day action of the Napoleonic Wars, involving more than 250,000 troops and resulted in at least 70,000 total casualties. The French Grande Armée under Emperor Napoleon I attacked the Imperial Russian army of General Mikhail Kutuzov near the village of Borodino, west of the town of Mozhaysk, eventually capturing the main positions on the battlefield, but failing to destroy the Russian army. The battle itself ended in disengagement, but strategic considerations and the losses incurred forced the Russians to withdraw the next day. 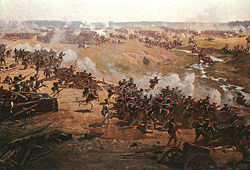 The battle at Borodino was a pivotal point in the campaign, since it was the last offensive action fought by Napoleon in Russia. By withdrawing, the Russian army preserved its military potential, eventually forcing Napoleon out of the country. 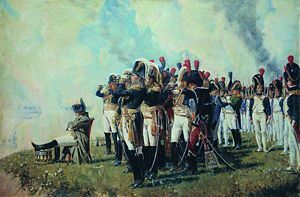 The French Grande Armée had begun its invasion of Russia in June 1812. Tsar Alexander I proclaimed a Patriotic War in the defense of the motherland. The Russian forces—initially massing along the Polish frontier—fell back before the speedy French advance. Count Michael Barclay de Tolly was serving as commander-in-chief of the Russian army, but his attempts at forming a defensive line were thwarted by the fast moving French. Napoleon I on the Borodino Heights, by Vasily Vereshchagin (1897). Napoleon advanced from Vitebsk hoping to catch the Russian Army in the open where he could exterminate it. The French Army was not in a good position since it was 575 miles from its nearest logistical base at Kovno. This allowed the Russians to attack the extended French supply lines. Despite this, the lure of a decisive battle drove Napoleon on. The central French force, under Napoleon’s direct command, had crossed the Niemen with 286,000 men, but, by the time of the battle, it only numbered 161,475 (most had died of starvation and disease). Barclay had been unable to offer battle, which allowed the Grand Armée’s logistic problems to deplete the French. Internal political in-fighting by his sub-commanders also prevented earlier stands by the Russian armies on at least two occasions. Barclay's constant retreat before the French onslaught was perceived by his fellow generals and by the court as an unwillingness to fight, and he was removed from command. The new Russian commander, Prince Mikhail Kutuzov, was also unable to establish a defensive position until within 125 kilometers of Moscow. Kutuzov picked an eminently defensible area near the village of Borodino and, from September 3, strengthened it with earthworks, notably the Rayevski Redoubt in the center-right of the line and three open, arrow-shaped "Bagration flèches" (named for Pyotr Bagration) on the Russian left. 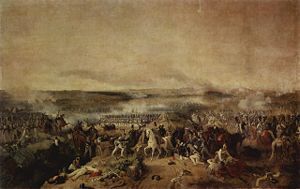 Battle of Borodino, by Peter von Hess, 1843. Russian forces present at the battle included 180 infantry battalions, 164 cavalry squadrons, 20 Cossack regiments, and 55 artillery batteries (637 artillery pieces). In total the Russians fielded 103,800 troops. There were 7,000 Cossacks as well as 10,000 Russian militiamen in the area who did not participate in the battle. After the battle the militia units were broken up in order to provide reinforcements to depleted regular infantry battalions. Of the 637 Russian artillery pieces, 300 were held in reserve and many of these guns were never committed to the battle. French forces included 214 battalions of infantry, 317 squadrons of cavalry and 587 artillery pieces, a total of 124,000 troops. However, the French Imperial Guard, which consisted of 30 infantry battalions, 27 cavalry squadrons, and 109 artillery pieces, 18,500 troops were never committed to action. Kutuzov assumed command on August 29, 1812. The 67-year old general lacked experience in modern warfare and was not seen by his contemporaries as the equal of Napoleon. He was favored over Barclay, however, because he was Russian, not of German extraction, and it was also believed that he would be able to muster a good defense. Perhaps his greatest strength was that he had the total loyalty of the army and its various sub-commanders. 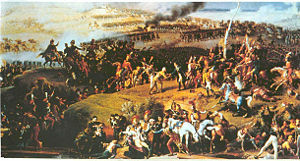 Kutuzov ordered another retreat to Gshatsk on August 30, and by that time the ratio of French to Russian forces had shrunk from three to one to five to four. The position at Borodino was selected because it was the good defensive position before Moscow itself was reached. The initial Russian disposition, which stretched south of the new Smolensk Highway (Napoleon's expected route of advance), was anchored on its left by an pentagonal earthwork redoubt erected on a mound near the village of Shevardino. The French, however, advanced from the west and south of the village, creating a brief but bloody prelude to the main battle. General Mikhail Illarionovich Kutuzov at Borodino. 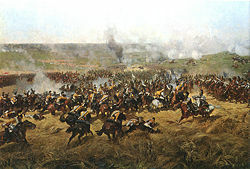 The struggle opened on September 4, when Prince Joachim Murat's French forces met Konovnitzyn's Russians in a massive cavalry clash. The Russians eventually retreated to the Kolorzkoi Clositer when their flank was threatened. Fighting was renewed on the 5, but Konovyitzyn again retreated when his flank was threatened by the arrival of Prince Eugene's Fourth Corps. The Russians retreated to the Shevardino Redoubt, where a sharp fight occurred. Murat led Nansouty's First Cavalry Corps and Montbrun's Second Cavalry Corps, supported by Compan's Division of Louis Nicholas Davout's First Infantry Corps against the redoubt. Simultaneously, Prince Josef Poniatowski's infantry attacked the position from the south. The redoubt was taken at the cost of some 4,000 French and 7,000 Russian casualties. The unexpected French advance from the west and the seizure of the Shevardino redoubt threw the Russian position into disarray. The left flank of their defensive position was gone and Russian forces withdrew to the east, having to create a new, makeshift position centered around the village of Utitza. The left flank of the Russian position was, therefore, hanging in the air and ripe for a flanking attack. The Russian position at Borodino consisted of a series of disconnected earthworks running in an arc from the Moskva (Moscow) River on the right, along its tributary the Kalocha (whose steep banks added to the defense) and towards the village of Utitza on the left. Thick woods interspersed along the Russian left and center (on the French side of the Kolocha) also aided the defense by making the deployment and control of French forces difficult. The Russian center was defended by the Raevsky Redoubt, a massive open-backed earthwork mounting 19 12-pounder cannon which had a clear field of fire all the way to the banks of the Kolocha stream. Kutuzov, who was expecting a corps-sized reinforcement to his right, planned to cross the Kolocha north of Borodino, attack the French left, and roll it up. This helped explain why the more powerful 1st Army under Barclay was placed in already strong positions on the right, which were virtually unassailable by the French. The 2nd Army, under Bagration, was expected to hold on the left but had its left flank hanging in the air. Despite the repeated pleas of his generals to redeploy their forces, Kutuzov did nothing to change these initial dispositions. Thus, when the action began and became a defensive rather than an offensive battle for the Russians, their heavy preponderance in artillery was wasted on a right wing that would never be attacked while the French artillery did much to help win the battle. Nansouty's cavalry attack squares of Russian grenadiers to the left of Semyanovskaya (foreground) to support Ney's attack. Detail from the Borodino Panorama by Franz Alekseevitch Rubo, 1912. Whatever may be said of Kutuzov's dispositions, Napoleon showed little flair on the battlefield that day. Despite Marshal Davout's suggestion of a maneuver to out-flank the weak Russian left, the Emperor instead ordered Davout's First Corps to move directly forward into the teeth of the defense, while the flanking maneuver was left to the weak Fifth Corps of Prince Poniatowski. The initial French attack was aimed at seizing the three Russian positions collectively known as the Bagration flèches, four arrow-head shaped, open-backed earthworks which arced out to the left en echelon in front of the Kolocha stream. These positions helped support the Russian left, which had no terrain advantages. The fleches were themselves supported by artillery from the village of Semyanovskaya, whose elevation dominated the other side of the Kolocha. The battle began at 0600 with the opening of the 102-gun French grand battery against the Russian center. Davout sent Compan's Division against the southern-most of the fleches with Dessaix's Division echeloned out to the left. When Compan debouched from the woods on the far bank of the Kolocha, he was greeted by massed Russian cannon fire. Both Compans and Desaix were wounded, but the attack was pressed forward. Davout, seeing the confusion, personally led his 57th Brigade forward until he had his horse shot from under him. He fell so hard that General Sorbier reported him as dead. General Rapp arrived to replace him only to find Davout alive and leading the 57th forward again. Rapp then lead the 61st Brigade forward when he was wounded (for the 22nd time in his career). By 0730, Davout had gained control of the three fleches. Prince Bagration quickly led a counterattack that threw the French out of the positions only to have Marshal Michel Ney lead a charge by the 24th Regiment that retook them. Although not enamored of Barclay, Bagration turned to him for aid, ignoring Kutuzov altogether. Barclay, to his credit, responded with dispatch, sending three guard regiments, eight grenadier battalions, and twenty-four 12 pounder cannon at their best pace to bolster Semyenovskaya. Ney's infantry push Russian grenadiers back from the fleches (which can be seen from the rear in the background). Detail from the Borodino Panorama. During the confused fighting, French and Russian units moved forward into impenetrable smoke to be smashed by artillery and musketry fire that was horrendous even by Napoleonic standards. Infantry and cavalrymen had difficulty maneuvering over the heaps of corpses and masses of wounded. Prince Murat advanced with his cavalry around the fleches to attack Bagration's infantry, but was confronted by Duka's 2nd Cuirassier Division supported by Neverovsky's infantry. This counter punch drove Murat to seek the cover of allied Wurtemburger Infantry. Barclay's reinforcements, however, were sent into the fray only to be torn to pieces by French artillery, leaving Fraint's Division in control of the Russian forward position at 1130. Dust, smoke, confusion, and exhaustion all combined to keep the French commanders on the field (Davout, Ney, and Murat) from comprehending that all the Russians before them had fallen back, were in confusion, and ripe for the taking. Reinforcements requested from Napoleon, who had been sick with a cold and too far from the action to really observe what was going on, were refused. It may simply have been a matter of the Emperor refusing to utilize his last reserve, the Imperial Guard, so far from home. Saxon cuirassiers and Polish lancers of Latour-Maubourg's cavalry corps clash with Russian cuirassiers. Rise of Raevsky redoubt is on right. Steeple of Borodino church in background. Detail from the Borodino Panorama. Prince Eugene advanced his corps against the village of Borodino, taking it in a rush from the Russian Guard Jaegers. However, the advancing columns were disordered and once they cleared Borodino, and they faced fresh Russian assault columns that drove the French back to the village. General Delzons was posted to Borodino to ensure that the Russians would be unable to retake it. Morand's division then crossed to the north side of the Semyenovka Brook, while the remainder of Eugene's forces crossed three bridges across the Kalocha to the south, placing them on the same side of the stream as the Russians. He then deployed most of his artillery and began to push the Russians back toward the Raevsky redoubt. Broussier and Morand's divisions then advanced together with furious artillery support. The redoubt changed hands, Paskevitch's regiment fleeing and having to be rallied by Barclay. Kutuzov then ordered Yermolov to take action and the general brought forward three horse artillery batteries under Colonel Nikitin (Commander of the artillery reserve) which began to blast the open-ended redoubt while the 3rd Battalion of the Ufa Regiment and two jaeger regiments brought up by Barclay rushed in with the bayonet to eliminate Bonami's Brigade. This action returned the redoubt to Russian control. Eugene's artillery continued to pound Russian support columns while Marshals Ney and Davout set up a crossfire with artillery on the Semenovskoye heights. Barclay countered by moving Eugene (Russian) over to the right to support Miloradovitch in his defense of the redoubt. When the general brought up troops against an attacking French brigade he described it as "A walk into Hell". During the height of the battle, Kutuzov's subordinates were making all of the decisions for him. According to Colonel Karl von Clausewitz of On War fame, the Russian commander "seemed to be in a trance." With the death of General Kutaisov, Chief of Artillery, most of the Russian cannon sat useless on the heights to the rear and were never ordered into battle, while the French artillery was wreaking havoc on the Russians. 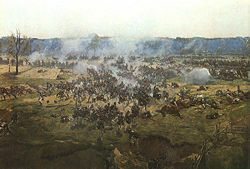 French and Russian cavalry clash behind the Raevsky redoubt, details from Rubo's panoramic painting. At 1400, the assault against the redoubt was renewed by Napoleon with Broussier's, Morand's, and Gerard's divisions launching a massive frontal attack with Chastel's light cavalry division on their left and the II Reserve Cavalry Corps on their right. General Caulaincourt ordered Wathier's cuirassier division to lead the assault. Barclay watched Eugene's (France) assault preparations and countered by moving forces against it. The French artillery, however, began chopping up the assembling force even as it gathered. Caulaincourt led the attack of Wathier's cuirassiers into the opening at the back of the redoubt and met his death as the charge was stopped cold by Russian musketry. General Thielemann (French) then led eight Saxon and two Polish cavalry squadrons against the back of the redoubt while officers and sergeants of his command actually forced their horses through the redoubt's embrasures, sowing confusion and allowing the French cavalry and infantry to take the position. The battle had all but ended, with both sides so exhausted that only the artillery was still at work. Napoleon once again refused to release the guard and the battle wound down around 1600. Modern reenactment of the battle. Barclay communicated with Kutuzov in order to receive further instructions. According to Wolzogen (in an account dripping with sarcasm), the commander was found a half-hour away on the road to Moscow, encamped with an entourage of young nobles and grandly pronouncing he would drive Napoleon off the next day. Despite his bluster, Kutuzov knew from dispatches that his army had been too damaged to fight a continuing action the following day. He knew exactly what he was doing: By fighting the pitched battle he could now retreat with the Russian army still intact, lead its recovery, and force the damaged French forces to move even further from their bases of supply. The denouement became a textbook example of what a hold logistics placed upon an army far from its center of logistics. On September 8, the Russian army moved away from the battlefield in twin columns to Semolino, allowing Napoleon to occupy Moscow and await a Russian surrender that would never come. The casualties of the battle were staggering: 28,000 French soldiers and 29 generals were reported as dead, wounded, or missing. 52,000 Russian troops also were reported as dead, wounded, or missing, although 8,000 Russians would later return to their formations bringing Russian losses to around 44,000. Twenty-two Russian generals were dead or wounded, including Prince Bagration. It should be noted that a wound upon that battlefield was a death sentence as often as not, there not being enough food even for the healthy. As many wounded died of starvation as from their wounds or lack of care. French infantrymen had expended almost two million rounds of ammunition, while their artillery had expended some 60,000 rounds. This amount of flying metal had severe effects on the participants. Around 8,500 casualties were sustained during each hour of the conflict—the equivalent of a full-strength company wiped out every minute. In some divisions casualties exceeded 80 percent of reported strength prior to the battle. Napoleon's own account of the battle gives a good understanding of it: "Of the fifty battles I have fought, the most terrible was that before Moscow. The French showed themselves to be worthy victors, and the Russians can rightly call themselves invincible." Poet Mikhail Lermontov romanticized the battle in his poem, "Borodino," based on the account of his uncle, a combat participant. The battle was famously described by Count Leo Tolstoy in his novel, War and Peace as "a continuous slaughter which could be of no avail either to the French or the Russians." A huge panorama representing the battle was painted by Franz Roubaud for the centenary of Borodino and installed on the Poklonnaya Hill in Moscow to mark the 150th anniversary of the event. Pyotr Ilyich Tchaikovsky also composed his 1812 Overture to commemorate the battle. There exists today a tradition of reenacting the battle on August 26. On the battlefield itself, the Bagration fleches are still preserved and there is a modest monument to the French soldiers who fell in the battle. There are also remnants of trenches from the seven-day battle fought at the same battlefield in 1941, between the Soviet and German forces (which took fewer human lives than the one of 1812). 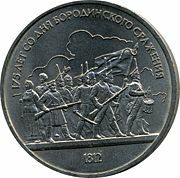 A commemorative 1-ruble coin was released in the USSR in 1987, to commemorate the 175th anniversary of the Battle of Borodino, and four million of them were minted. A minor planet, 3544 Borodino, discovered by Soviet astronomer Nikolai Stepanovich Chernykh in 1977, was named after the village Borodino. ↑ Digby Smith, The Greenhill Napoleonic Wars Data Book (London: Greenhill Books, 1998), p. 391. ↑ 16.0 16.1 Riehn, p. 236. ↑ Fortune City, Battle of Shevardino. Retrieved June 25, 2008. ↑ 20.0 20.1 Riehn, p. 243. ↑ 21.0 21.1 21.2 Riehn, p. 244. ↑ 24.0 24.1 Riehn, p. 246. ↑ 30.0 30.1 Riehn, p. 250. ↑ 31.0 31.1 31.2 Riehn, p. 251. ↑ 38.0 38.1 Riehn, p. 255. ↑ Alexander Mikaberidze, The Battle of Borodino: Napoleon Against Kutuzov (London: Pen & Sword, 2007, ISBN 978-1844156030). ↑ Napoleon.org, Borodino. Retrieved June 25, 2008. ↑ Russian Mint, Добро пожаловать на сервер "Монетный двор." Retrieved June 25, 2008. ↑ Lutz D. Schmadel, Dictionary of Minor Planet Names (New York: Springer Verlag, 2003, ISBN 3540002383). Chandler, David G. Dictionary of the Napoleonic Wars. London: Wordsworth editions Ltd., 1999. ISBN 9780025236707. Duffy, Christopher. Borodino and the War of 1812. London: Cassell & Company, 1972. ISBN 9780684131733. Hourtoulle, F.G. Borodino/The Moskova: The Battle for the Redoubts. Paris: Histoire & Collections, 2000. ISBN 9782908182965. Mikaberidze, Alexander. The Battle of Borodino: Napoleon Against Kutuzov. London: Pen & Sword, 2007. ISBN 9781844156030. Markham, David. Napoleon for Dummies. New York: Wiley Pub Inc., 2005. ISBN 9780764597985. Nafziger, George F. Napoleon's Invasion of Russia. Novato CA: Presidio Press, 1988. ISBN 9780891413226. Riehn, Richard K. Napoleon's Russian Campaign. John Wiley & Sons, 2005. ISBN 9780070527317. Smith, D. The Greenhill Napoleonic Wars Data Book. London: Greenhill Books, 1998. ISBN 9781853672767. Troitskiy, N.A. Фельдмаршал Кутузов: Мифы и Факты, Центрполиграф (Field Marshal Kutuzov: Myths and Facts). 2002. History of "Battle of Borodino"